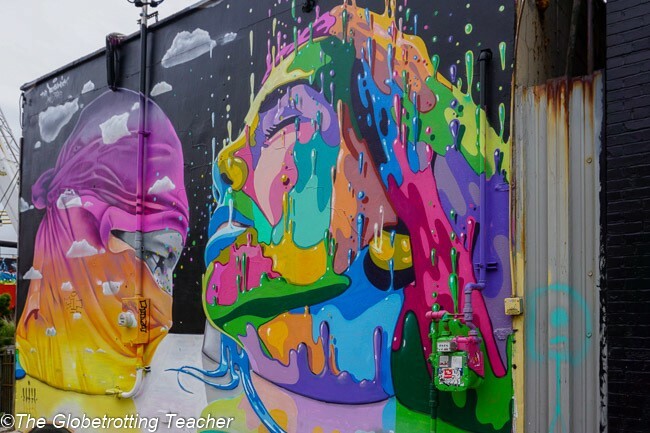 You don’t need to know the ins and outs of the street art culture to be wowed by the colorful walls in Brooklyn’s Bushwick neighborhood. 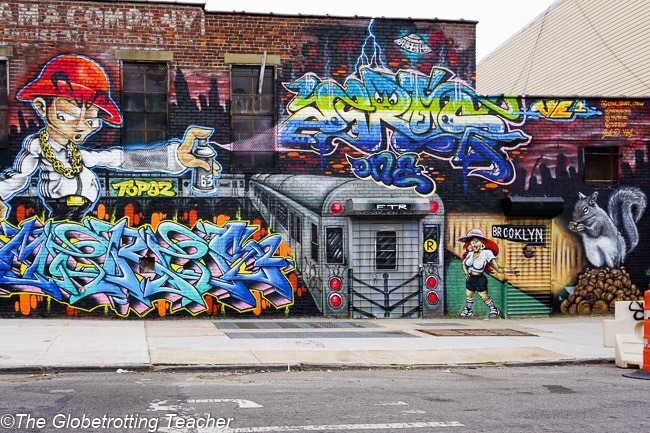 Once one of NYC’s most dangerous neighborhoods, Bushwick has now become the go-to place to immerse yourself in the city’s urban art scene and to see, arguably, the world’s finest display of street artistry. 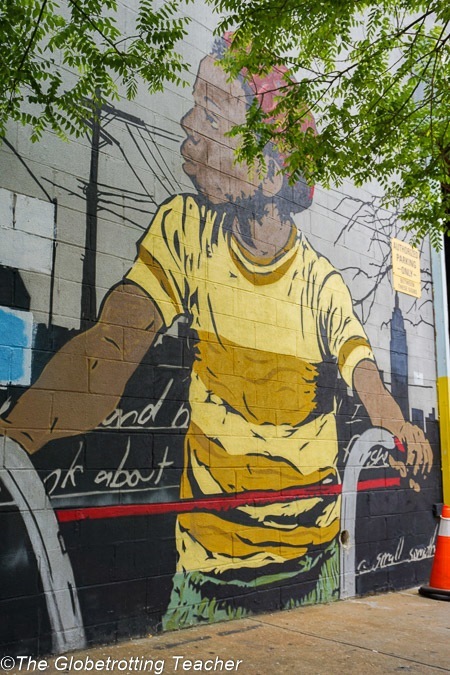 Whether it’s your first time in NYC or not, dedicate an afternoon to the streets in Brooklyn New York and explore this open-air, living, breathing, ever-evolving street art collection. Save this for later! 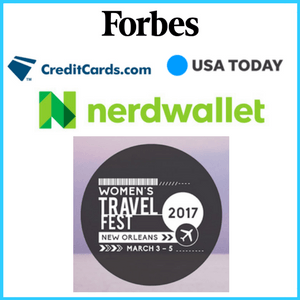 Pin it to your Pinterest Travel Board. 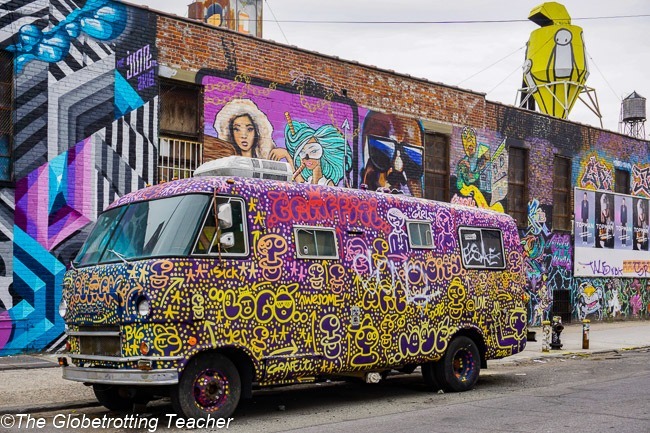 I was excited to join the Brooklyn Unplugged Graffiti & Street Art Tour. For one, it’s always fun to be a tourist in your own city! But, even better, I love tours that teach something new. I’ve admired street art in cities like London, Paris, and Budapest. But, I’m the first to admit I know nothing about the culture of it. The best graffiti NYC is actually much different than the best street art gallery NYC! It turns out graffiti is made of letters, numbers, and names that are meant to catch the eye of other taggers. On the other hand, street art is considered Post-Graffiti. It’s art not containing letters or names and it’s meant to grab the public’s attention. I couldn’t help but think how much clearer this made things. How many times have you walked past buildings with graffiti and frowned, or perhaps, not even batted an eye? But, murals painted on a building’s side stop you every time, calling you to take a closer look. And let me say, these are, hands down, the best murals in NYC. Whether you know much about it or not, like me, street art’s beautification of buildings, outdoor spaces, and neighborhoods is easy to see. Bushwick looks vibrant and has a pulsing hipster energy to it, in large part, because of the street art. What’s perhaps less visible, but equally as powerful, is the transformative effect the artists’ work has had on the neighborhood’s psyche. 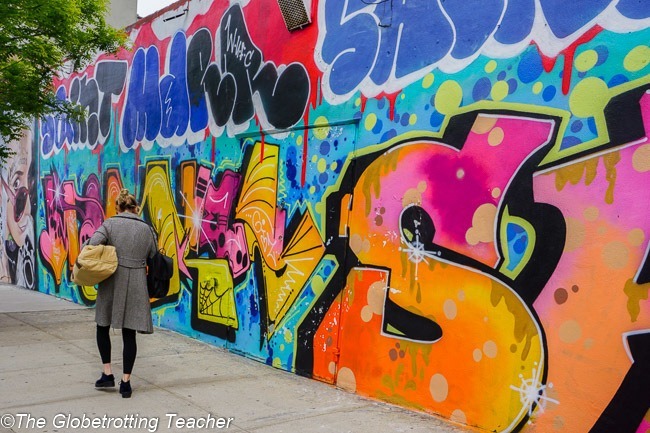 So, how’d all this street art end up in Bushwick anyways? Change happens when a force wills it so. In this case, the force was Joseph Ficalora. He grew up in the then crime-ridden Bushwick neighborhood and wanted to positively change the look and feel of the area. And, in the process, free himself from the painful memories over losing both his parents in the neighborhood, too. In particular, he wanted to stop random graffiti taggers from haphazardly marking up buildings. In 2012, he founded The Bushwick Collective, a street art gallery in new york. 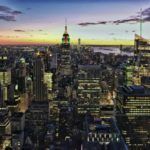 (Brooklyn, New York that is!) He began by reaching out to street artists all over the world promising them a wall in exchange for their mural. Turns out, the factories and abandoned industrial spaces lining the neighborhood’s streets proved to be the perfect place for a public art collective. The Bushwick Collective displays murals from the most famous graffiti and street artists from all over the world in an evolving display of street art. Murals stay up for a year before they’re changed. I loved this concept, especially for this gritty now turned trendy neighborhood. New murals and works of art change alongside the growth of the local community and from society as a whole. Doesn’t this bring to mind building or drawing in the sand at the beach only to have a fresh palette when the tide comes in? 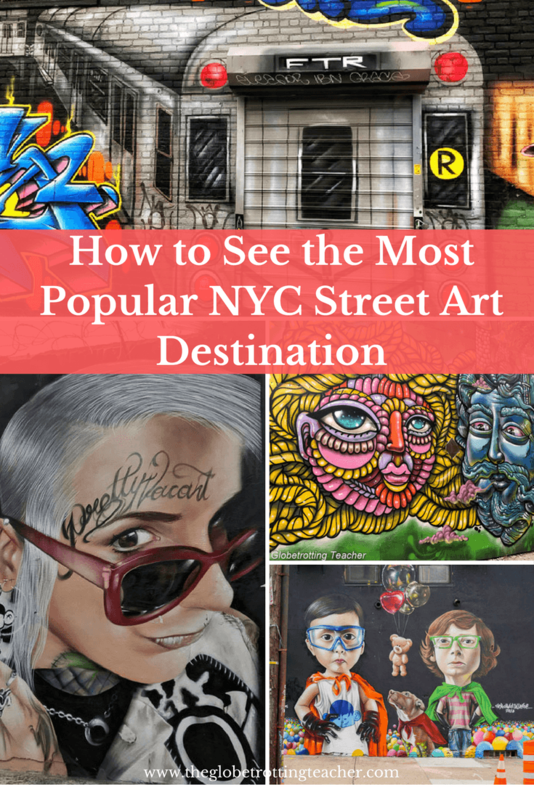 I love the idea this street art tour NYC would be different from year to year. This idea of fresh starts and new beginnings is one we all can appreciate and admire, too! And, over the last several years, the street art has stemmed off from the collective onto the surrounding neighborhood streets. Our guide, Jeff, walked with us for roughly 2 hours along a route about a mile long. We even got to see a street artist in the midst of creating a new mural! 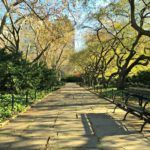 It can be so tempting to focus on NYC’s main sights and attractions, but there are so many reasons to leave Manhattan! 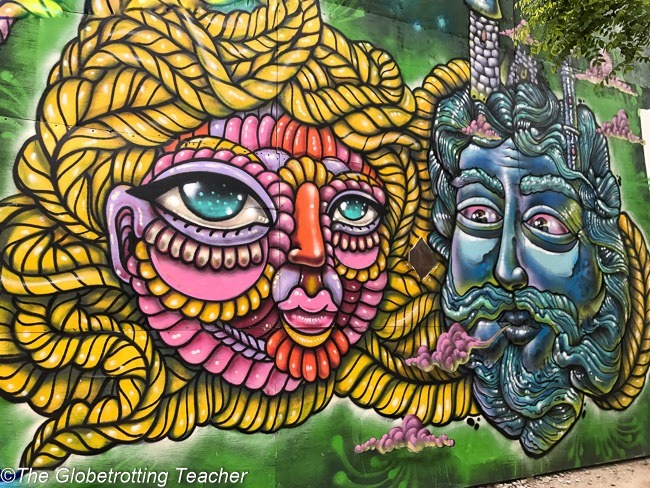 Touring the Bushwick Collective and the neighborhood’s urban art scene with Brooklyn Unplugged Tours is one such reason. 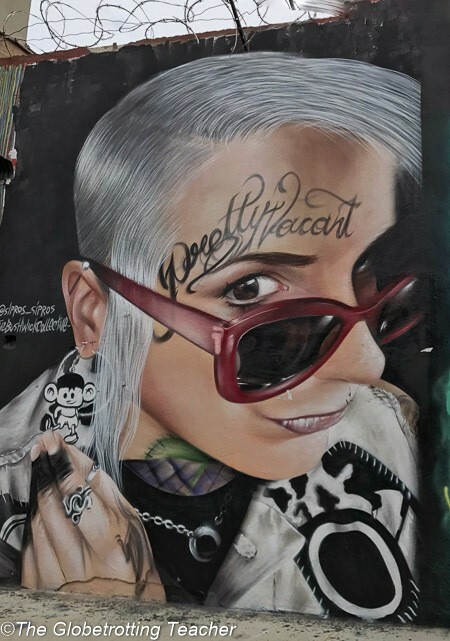 I really loved learning about Dasic Fernandez, a Chilean street artist, whose distinctive style features a reverse gravity effect. 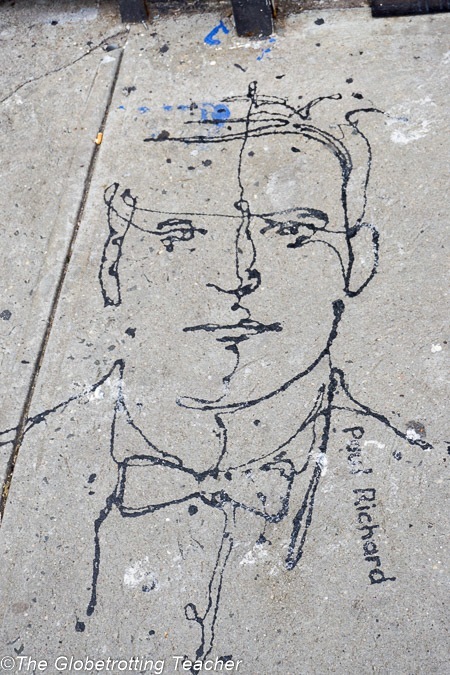 The sidewalk art of Paul Richard took my breath away simply because he creates portraits by dripping paint in such a quick way that he often goes unnoticed while he works! As someone with limited fine art skills, this almost doesn’t even compute in my brain! Not to mention blocks like these covered in gorgeous street art that make it hard to continue walking! 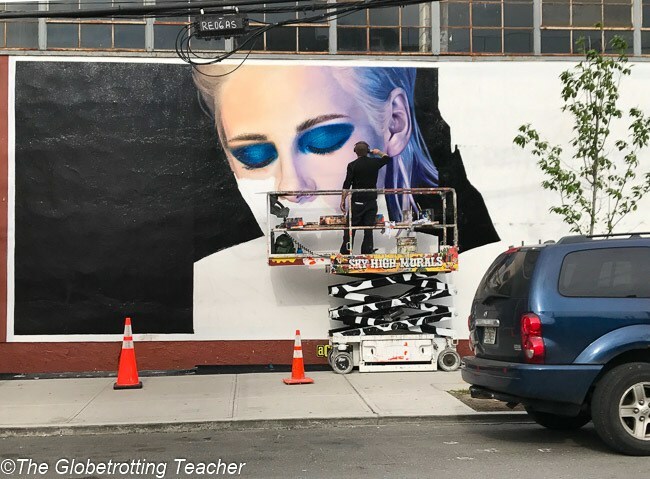 As much as you should get out of Times’ Square and spend time in Lower Manhattan, you need to make the quick trip out to Bushwick to see for yourself the street art NYC scene flourishing in Brooklyn. 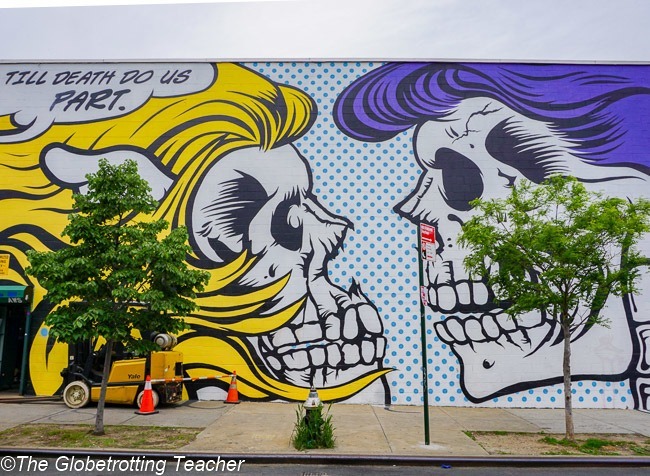 Brooklyn Unplugged offers a daily Graffiti and Street Art Walking Tour in and around the Bushwick Collective. 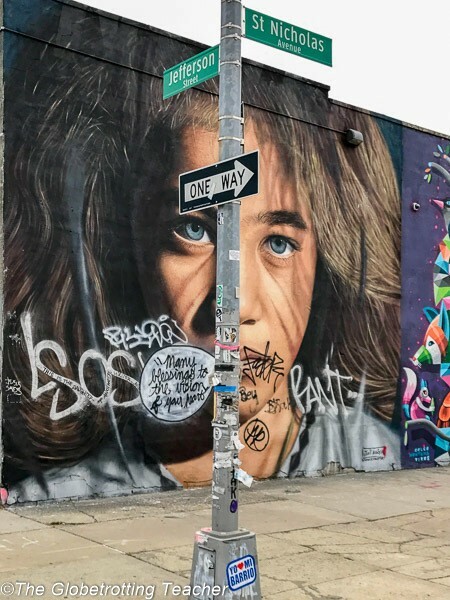 The tour is approximately 2 hours and walks along an easy route through the Bushwick neighborhood. 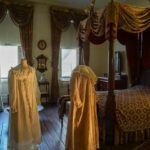 You can book your tour directly on their website. When the tour is finished, stick around for some New York pizza! 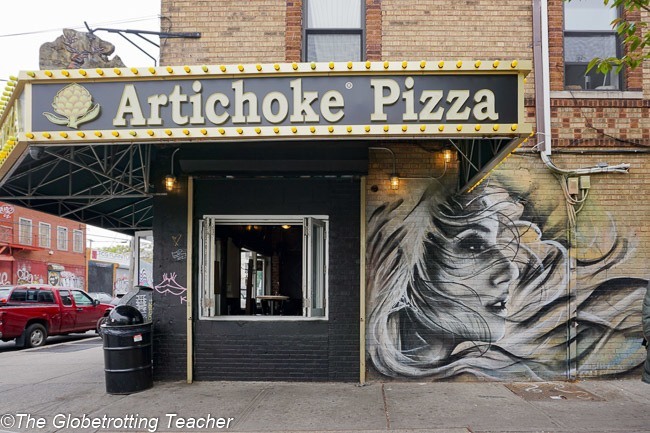 Roberta’s is legendary and you just have to save room for a signature slice from Artichoke Pizza. 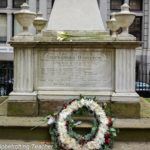 It’s one of my recommended 100 things to see and do in NYC. 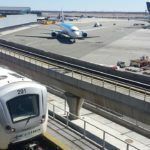 Bushwick is easily accessed from Manhattan by taking the “L” subway train at 14th Street to Jefferson Street in Brooklyn. Wear a pair of comfortable walking shoes and bring your camera to capture the vibrantly painted walls all around. 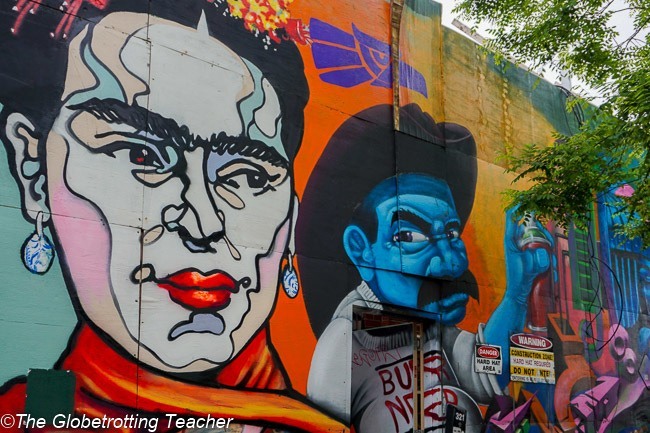 Do you like discovering street art when you travel? 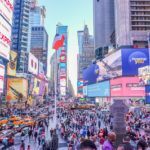 Would you like to do a street art tour in New York? Disclaimer: I was a guest of Brooklyn Unplugged on their Graffiti and Street Art Walking Tour. It was an informative tour with amazing urban art displays. As always, all opinions expressed in this article are my own. Another thoughtful article, Jackie. I have to confess I didn’t know the difference between street art and graffiti either – and here I call myself cultured. I saw the mysterious appearance of a Banksy creation in Chelsea and the buzz was huge. So fun. Now I’ll have to delve into Brooklyn. Thanks so much, Carol. 🙂 Banksy is quite the street art celebrity. Hope you can hop over to Brooklyn soon. 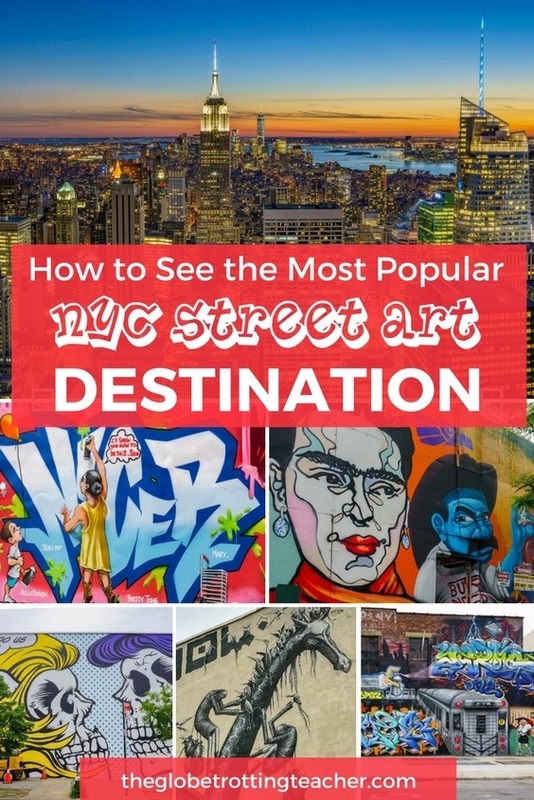 The street art scene has got a lot better since I visited New York City many many moons ago and I think I need a revisit to check all this out (as well as missing some of the top sights to see). This is the best collection I’ve seen in NYC, Danik. Totally worth a trip back to NYC. Whoop Whoop! Bushwick is the best! Up until last year I lived about a 10 minute walk from the start of the street art, learning more about the culture of it here was great as I never looked into that in all the time I lived there! I love urban street art and New York is the king of this scene. I remember reading a great book called Getting Up by Craig Castle about the NY street art scene in the 1980s. I loved that it is more accepted these days. Thanks for the book suggestion, Mike. I’ll check it out. NYC street art is definitely more visible and admired compared to decades ago. This is truly beautiful. I just love street art and these artists seem to have a lot of talent. I would like to visit this place for sure during my next visit. I love street art! I love how different it is from area to area, country to country. I’m glad more areas are embracing, rather than discouraging it. Agreed, Nathan! It’s much more accepted now, particularly as people see how street art can truly change entire neighborhoods. 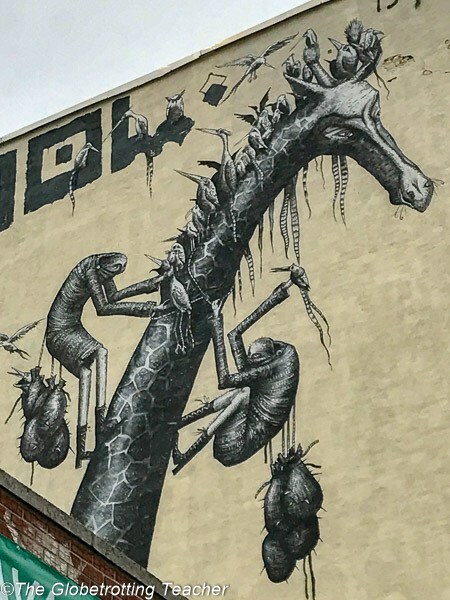 It really is incredible how powerful street art can be in transforming a neighborhood from a place which was once dangerous and feared, to something totally uplifting which inspires and draws crowds to see. 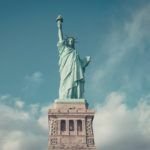 I’ve been to NYC a couple of times, though am ashamed to say I’ve not toured the Bushwick Collective – I would love the get back – the Brooklyn Unplugged Graffiti & Street Art Tour sounds really great. PS I had no idea the difference between street art and graffiti until now either!! I live in NYC, Megan and I hadn’t made it to see the Bushwick Collective until doing this tour. 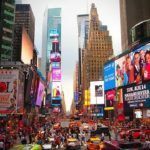 It’s so easy in NYC to stay in one area because there’s so much to see and do! I hope you get to visit again soon and hop over to Brooklyn to enjoy the street art. What a fabulous, funky neighborhood. I’m glad that’s is more accessible/less dangerous place for people to visit. I love it when these little pockets of communities evolve over time and come into their own. The artwork here is stunning and really brings some flair to the neighborhood. Yes, Vicki! It is such a funky neighborhood. I hope you get to visit on your next trip to NYC. 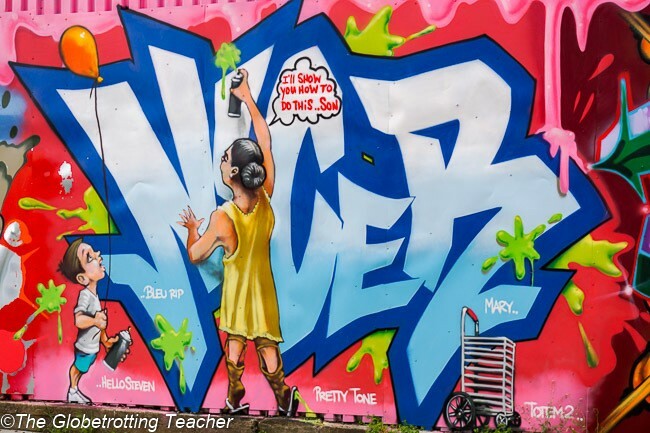 Loved the post as it talks about one of my fav topics, street art. Street art is so fascinating anywhere in the world. It transports you into a world of fantasy uniquely crafted by the imagination of unknown artists. Street art is also a mirror of the place and its times. 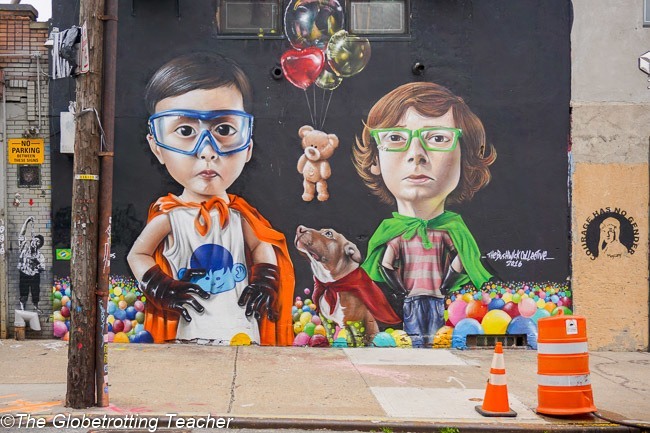 The NYC street art is an altogether different level of creativity and imagination. I love that street art reflects the place and time, Sandy. It has the power to be such an impactful messenger. I don’t know much about street art either, but I find the post-graffiti concept fascinating. It’s hard to compare the masterful works of art in Bushwick to the old-school vandalism on the sides of boxcars and bridges. This tour looks amazing and informative! That’s exactly it, Heather. When you take the time to really look, you recognize the incredible art being created.